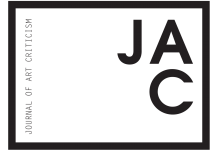 JAC is the first undergraduate journal in print devoted to art criticism. Founded in New York at Barnard College during the fall of 2015, the journal is published annually to include critical writing and art centered around a contemporary theme. Connecting the ideas of students across institutions, the journal is also a network of young and established critics. While students create, review, and edit work for JAC, a group of alumni and professionals support production. We stock print copies in NY at Printed Matter, McNally Jackson (SoHo and Williamsburg), Bookculture (W. 112th St.), the Barnard College Library, and the MoMA Library, as well as in MA at MIT Press and Trident Booksellers, and in OK at Commonplace Books. To have your work considered for publication in print or online, please submit here.